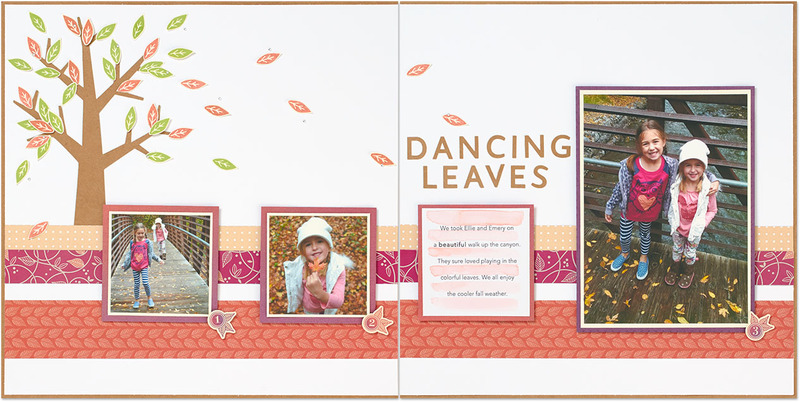 The beautiful tree scattering its leaves across the pages is undoubtedly the first thing you see when you look at this layout, but the idea for those beautiful Sunset leaves started with a pattern from the Sangria paper packet. Do you see them on that strip of Pomegranate paper across the middle of the page? It’s a simple thing, but it sparked a fun idea that became a central element of the page’s design. Even beyond the leaves, another patterned paper suggested the organizing principle of the page. The bottom strip of Poppy patterned paper with its horizontal rows of leaves gave our artist the idea to use multiple horizontal stripes as a basic design element, which is also repeated as watercolor stripes on the journaling, too. Taking just a few simple cues from the patterned papers, our artist created a beautifully unified layout. We simply love the Sangria paper packet for fall-themed layouts. The color palette is rich and festive. And the designs are beautiful! From warm ombres to swirls of Sunset leaves, the Sangria paper packet is sure to give you tons of ideas for creating memorable fall layouts. Next time you’re looking for artwork inspiration, try drawing it from the patterned papers you are working with. They are sure to help you realize your creative potential on any crafting project. Love this layout. Can’t wait to make one like it.